As the number of unaccompanied children trying to cross the U.S.-Mexico border has surged, the increase in apprehensions among children ages 12 and younger has been far greater than among teens, according to a Pew Research Center analysis of previously unreleased government data. The new figures, obtained through a Freedom of Information Act request by the Pew Research Center, provide the first publicly available detailed portrait of the age and home country of child migrants—unaccompanied and accompanied– caught at the U.S.-Mexico border from Oct. 1, 2012, to May 31, 2014. The time period covers the previous fiscal year and two-thirds (8 months) of the current one. Federal and state officials are scrambling to address the record number of unaccompanied minors (those traveling without a parent or guardian) apprehended at the U.S.-Mexico border in recent months, which has surged by tens of thousands. Media reports have described hundreds of children packed into holding facilities in Texas and across the Southwest, sleeping with thermal blankets and overwhelming the U.S. Border Patrol. President Obama has requested $3.7 billion to respond to what he has called a “humanitarian crisis,” and some Republican lawmakers are readying their own bills. From October through the end of May, 46,932 unaccompanied children, nearly all from Mexico and Central America, were taken into custody, according to data obtained from U.S. Customs and Border Protection. Recently released figures show that by the end of June, that number had risen to 57,525. 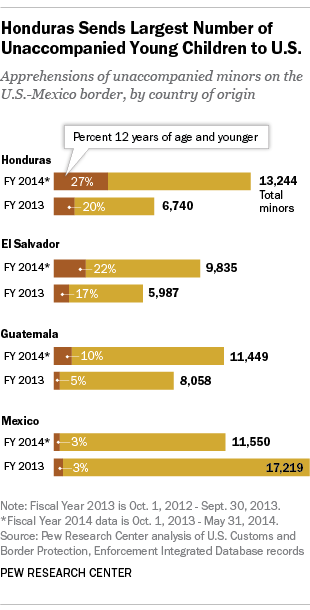 By comparison, 38,759 children were apprehended all of last fiscal year ending Sept. 30, 2013. The dramatic increase in children traveling to the U.S. without their parents from Honduras, El Salvador and Guatemala, is largely the result of high rates of poverty and violence in their home countries, according to U.S. Department of Homeland Security documents. Gang and drug trafficking violence had driven Honduras’s murder rate to 90 homicides per 100,000 inhabitants in 2012, the highest in the world. In El Salvador, the murder rate (41 per 100,000 in 2012) trails only Honduras, Venezuela and Belize. When looking at the data by country, a larger share of Honduran unaccompanied minors are younger than 12, compared with those from other countries. More than one-in-four (27%) apprehended Honduran children were ages 12 and under in fiscal year 2014, up from 20% the previous year. El Salvador ranks second in the share of minors apprehended at the border who are 12 years and younger, with the share increasing from 17% to 22% over the same time period. Among those from Guatemala, the share of minors apprehended at the border who are ages 12 and under has doubled to 10%. 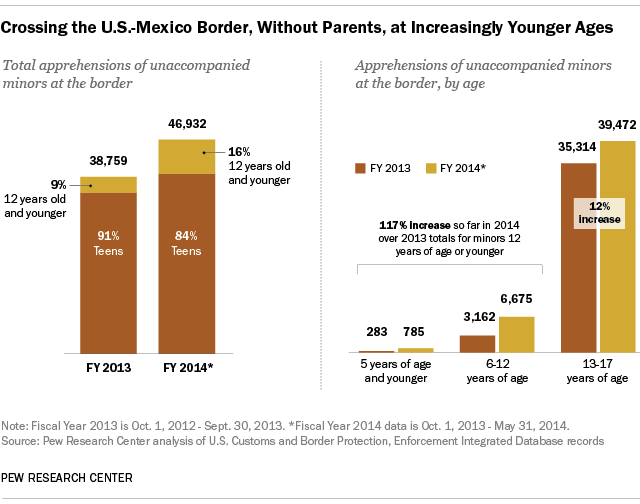 By contrast, just 3% of apprehensions of Mexican minors were young children during both fiscal years. Mexico’s apprehensions in fiscal year 2014 so far have not yet exceeded the previous year. Among all countries, less than 1% (94 cases) of apprehended unaccompanied children are younger than 1, and only about 2% (785) are 5 or younger, according to data for the current fiscal year. Children ages 6 to 12 accounted for 14% (6,675) apprehensions. The U.S. categorizes children as “unaccompanied” if they are not traveling with a parent or guardian, although they may have traveled with another relative. While the surge in unaccompanied children has received a lot of media attention, the number of apprehensions of children who are accompanied by a parent or guardian has increased at a far faster clip, nearly tripling (160% increase) in less than a year. In the partial fiscal year 2014 data provided, 22,069 accompanied children were apprehended, up from just 8,479 during all of the previous fiscal year. Children who travel with a parent tended to be younger than those who travel without one. About eight-in-ten (81%) apprehended accompanied children were 12 years or younger, compared with just 16% of apprehended unaccompanied children, according to the 2014 data. Among children apprehended at the border with a parent or guardian, Honduras again stands out as the top country of origin. Fiscal year 2014 data shows 12,074 accompanied Honduran children have been apprehended so far, a 434% increase over the previous year.